Getting Started with Processes using Policy Manager. Learn about common and operation-specific processes, process management tools, and use cases. Define the sequence of messages as they flow through for each virtual service operation. Configure a variety of different Activities for achieving the results required for each operation. Let's take a quick walkthrough of the process types and tools available, to get you started. 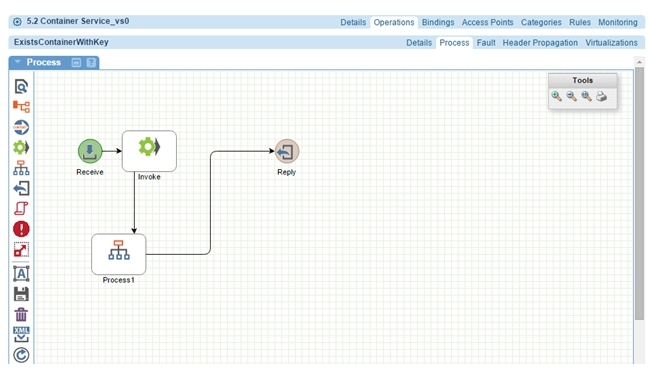 You can configure a set of common processes for an organization, using the Add Process function. Common processes are available for all resources within the organization. In Policy Manager, choose Services > Operations > Process or Services > Operations > Fault. In the developer portal, go to the API Implementation page. If you define processes at the organization level, you can reference/re-use them at the operation level. This approach is most efficient for processes that might be used multiple times, and can help make your process development cycle more efficient. The example below shows referencing a process using a Process Activity in the Process Editor. In the same way that you can reuse a process by referencing it, you can also reuse a script. Add a script reference for the function you want to perform. For example, you might have a requirement to validate some data as part of your process. In this example, you might create a reusable script that includes a function for validating data (validateData), and call the script TestScript. 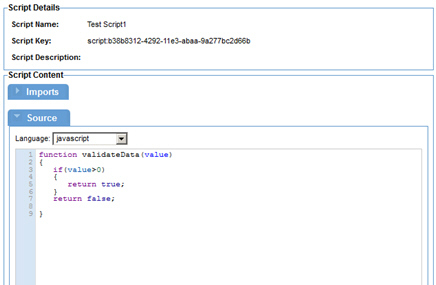 Then, in your process definition, you can import TestScript and reference the function in the script source. This example is shown below. The Process Function Reference includes a tour of the Process Editor and descriptions and usage examples for each Activity type. To ensure a smooth process when building your process definitions, familiarize yourself with the functionality, techniques, and rules for using each Activity. For more information, refer to Process Reference for Policy Manager. In Policy Manager: Documentation files in the docs\scriptDocs folder of the Akana Platform Folder. On the Akana Documentation Repository, choose the applicable version: Policy Manager Scripting API. For an overview of all the tools in the Process Palette, and functions that apply to the common process definitions, see Managing Processes. The procedure below walks you through adding a Script activity to a specific operation using the Process Editor. When you've added the script, you can run the operation in Test Client and you will see a new header in the Response/Headers tab. Open the Process Editor for a specific operation. Drag and drop the Script Activity icon to the grid. Drag the end arrow from Reply Activity to Script Activity. This directs the Script Activity to execute directly after the Invoke Activity. Click the center of the Script Activity and drag and drop (draw) a new arrow to the center of the Reply Activity. This directs the Reply Activity to execute after the Script Activity. Double-click any activity to go to the Activity Edit page. Click the Save icon (on the palette) to save the data. Click Cancel to exit the Process Editor and return to the Implementation page. For additional information on using script activity variables, refer to the Process Editor reference documentation for the Script activity. Now that you've familiarized yourself with the high-level approach of building processes, and know what reference materials and tools are available, you can start building your processes.